Spend two fabulous weeks cruising around the green American states of Washington and Oregon. 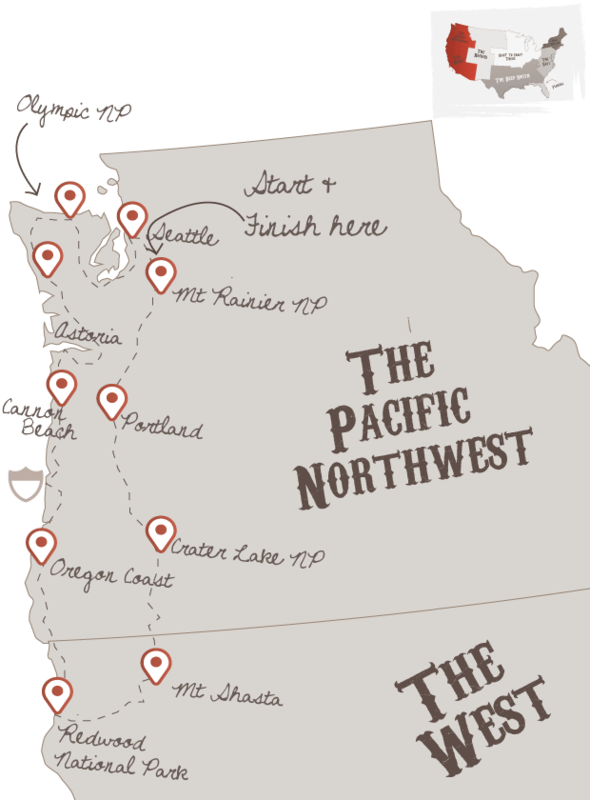 You’ll experience glorious coastlines, enchanting forests, gigantic redwoods and two hip cities as you drive around America’s Pacific Northwest. Fly to Seattle in the northwestern corner of the lower 50 States, enjoy an evening meal at one of the freshly stocked seafood restaurants that are dotted everywhere in this city by the ocean. Seattle is one of the fastest growing cities in America, famous for its coffee, grunge music and tech sector. It has a laid-back charm with visitor highlights like Pike Place Market, the Space Needle and Pioneer Square. A second full day to explore the Emerald City, further highlights include the Boeing Museum, Japanese Gardens and watching the sunset in Kerry Park. Should you prefer less time in the city and more time in the great outdoors, then just let us know and we’ll adjust the road trip to match your preferences. The great outdoors await today, we recommend you start the first leg of your drive by taking a ferry over to Bainbridge Island before moving onto Olympic National Park via scenic Highway 101. Make Hurricane Ridge one of your first places to visit to get a view of the Olympic Mountains. The words rugged, craggy and remote come to mind when thinking of Olympic National Park. Situated in the far northwest of Washington State, this is one of the wettest places you’ll be ever likely to visit. You won’t be alone though, wild Roosevelt Elk love it here amongst the trees, alpine meadows and waterfalls. Continue along scenic Highway 101, heading south down the coast to Cannon Beach in neighbouring Oregon. Along the way, you can stop in Astoria, where classic 80s films like The Goonies and Short Circuit were shot. You'll then reach Cannon Beach and Haystack Rock which is a much photographed landmark on the Oregon coast. Cruise south on the 101, stopping at the points of interest and places of outstanding beauty which will be listed in your personalised Road Trip Pack. Massive sandstone boulders look like they have been dropped from the heavens along this stretch of coastline. Rugged, wild and wind-swept Oregon’s beauty is up with the best of them. You’ll leave Oregon today and enter into Northern California in search of giant Redwood trees, along the way you’ll explore highlights like Shore Acres State Park and Cape Arago. Rather surprisingly, there are even 40 miles of sand dunes located in the North Bend area. Redwoods were once common throughout North America but now sadly are mostly found in just Oregon and California. For the ultimate Sequoias experience head to the Redwood National Park in northern coastal California. These are true giants at up to 100m high and 11m in diameter. Once you've stood amongst these trees, the stresses of work and home life just melt away. Having witnessed the majestic coastal redwoods of the Californian coast, you’ll drive inland and head for California’s fifth highest peak - Mount Shasta. Standing over 14,000 feet high, this dormant volcano can be seen from miles away. Crater Lake has inspired people for hundreds of years. No place else on earth combines a deep pure blue lake, sheer surrounding cliffs, two picturesque islands and a violent volcanic past. It is a place of immeasurable beauty, and an outstanding outdoor laboratory and classroom. After more than a week in some of the most stunning outdoor scenery anywhere in the world, it’s time to hit the streets of a major city again. Hip Portland offers gardens, cafe culture, tax-free shopping and much more. Pioneer Square in the heart of the city is a great place to start. A full day exploring friendly Portland is on offer today, highlights include The Rose Test Gardens, The Japanese Gardens and Oregon Zoo. These three tourist treats all lie within Washington Park on the western edge of the city. Be sure to visit the Pearl District too for art galleries, interior design stores and trendy boutiques. As today is a relatively short drive we recommend that you take a detour and cruise along the Columbia River Gorge en route to Mount Rainier National Park. Be sure to visit Multnomah Falls along the way. Mount Rainier is the highest mountain in the Cascade mountain range and is a spectacular park with wildflower meadows, glaciers, waterfalls and wildlife.The following morning you’ll head back to Seattle and fly home. Don't forget to check out this road trip's Itinerary tab to see more amazing pictures from our Classic North West tour. You'll also be able to read a little bit about what you'll be getting up to on each day of this incredible road trip adventure.